A full time academic since 1993, Christopher previously worked as an accountant and practised as a commercial lawyer. His academic career has traversed both Business and Law schools, teaching in a variety of commercial law compulsory and optional topics both in Australia and Malaysia. He spent 2 years as Deputy Dean of Flinders Law School and is now Deputy Dean at Adelaide Law School. 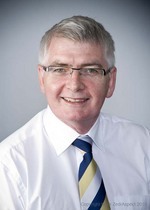 Always active in relevant professional bodies, Christopher served for 20 years on an accounting professional body’s disciplinary tribunal, was National President of the Corporate Law Teachers Association and continues his involvement with the ARITA and the Law Council’s Insolvency and Reconstruction Committee. Since 2011 Adelaide Law School has had a research unit known as Bankruptcy and Insolvency Law Scholarship (BILS), now known as Regulation of Corporate Insolvency and Tax (ROCIT) and Christopher is the Director with Associate Professor David Brown.